Oakland International Airport Parking Your car can pay for your parking space. Oakland International Airport Parking : As a traveler, you are likely to have an idea of how busy and crowded airports can be. More so, you may have a hint of how on-airport parking can be tedious. Regarding that, you look for the easiest and possibly the quickest way to park and attend to the awaiting tasks. 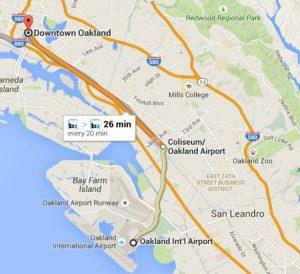 TravelCar is now present at Oakland International Airport (OAK). We are here to solve your parking issues by giving you pocket-friendly parking deals. TravelCar also offers ride-sharing services, valet parking services, car rentals, general car maintenance at the parking lots and specified car detailing services. We have a diverse selection of rental cars that you can hire to explore the Oakland region. Access our rental cars and drive to neighboring towns to see tourist attraction sites in Oakland. You can also access our parking lots at train stations, major airports in the U.S.A and Oakland, nearby seaports and hotels. Make an inquiry on our availability in your locality by calling our official line +1 888-807-0209. Oakland International Airport is located in Oakland City, Alameda County, State of California, in the United States of America. The airport was constructed in 1927 about 10 miles from Downtown Oakland in the Southern direction. The Port of Oakland owns and operates Oakland International Airport. Aside from facilitating cargo and passenger transport, Oakland International Airport hosts Fixed Base Operators (FBOs) at the North Field. The companies providing FBO services at OAK include Landmark Aviation, Kaiser Air, Alameda Aero Club, Oakland Aviation Museum, Sundance Air Services, Oakland Flyers, Signature Flight Support, Aerial Advertising Services and Pacific Aerial Surveys. Oakland International Airport is currently the fourth busiest airport in the State of California after Los Angeles International Airport, San Francisco International Airport, and San Diego International Airport in that order. Oakland International Airport is among three significant airports serving The Bay Area. The other two airports are Norman Y. Mineta San Jose International Airport and San Francisco International Airport. According to airport statistics of 2017, Oakland International Airport is number 36 in the list of airports with large passenger boarding. FedEx Express has established a hub at OAK. Allegiant Air and Southwest Airlines mainly operate in Oakland International Airport and have established their headquarters within the airport. Southwest Airlines dominate Terminal 2 of Oakland International Airport. Airlines at OAK fly to Europe, Mexico and other cities in the U.S.A. The airport handled 13,072,245 passengers and 236,601 aircraft operations in the year 2017. The Bay Area depends hugely on OAK for domestic and international flights. OAK has four runways, two passenger terminals, and covers 2,600 acres of land. The airport’s parking provides for both short-term and long-term parking. There is a Cell Phone Lot, Premier Lot, Economy Parking Lot, Hourly Parking Lot and a Daily Parking Lot. The Premier, Daily and Hourly Lots are located across Terminal 1 and Terminal 2. The Economy Lot and Cell Phone Lot are situated off John Glenn Drive. The Premier Parking Lot at OAK is fitted with eight charging stations for electric vehicles. TravelCar is your parking solution provider by giving you pocket-friendly parking deals that solve your parking problems. Parking can be tedious, boring, expensive at times, but TravelCar’s parking deals present you a seamless parking experience that you are unlikely to get anywhere at similar prices. With a team ever ready to serve you, TravelCar can guarantee you value for your money. So, you have driven your car to Oakland International Airport, either to board a flight or to drop a passenger; we have our parking lots offsite. Kindly note that you need to book online first before accessing our parking lots. Security of the parking premises is an important factor you may want to consider before parking your vehicle either for short-term or long-term periods. We have gates around the premise. We have CCTV video surveillance, and we have guards manning the area both day and night. The car maintenance program at our parking area covers both basic and advanced car detailing. For the basic car maintenance, we offer car wash, oil changing, checking tire pressure, electric vehicle charging, wheel alignment, and tire changing. The advanced car detailing services provided at our parking slots comprises of services like interior vacuuming, car polishing, and buffing. There are several shuttles at our parking lots that ferry passengers to their respective terminals of departure. The shuttles frequently depart for the terminals to hasten the traveling process. A shuttle ride is about five minutes long as we are very close to the terminals. Access pocket-friendly parking deals at major airports in the United States of America, seaports in the State of Oakland, train stations, hotels and business districts near Oakland International Airport. Below is a breakdown of the places you can get cheap parking through TravelCar. Explore the business centers in cities close to Oakland International Airport. The towns include Oakland, San Lorenzo, Cherryland, Castro Valley, Alameda, Ashland, Piedmont, San Leandro, Berkeley, San Francisco, and Orinda. Also check out Moraga, Fairview, South San Francisco and Hayward. Terminal 1 Gates 1-17 Alaska Airlines, Volaris, Azores Airlines, Southwest Airlines, Spirit Airlines, Arkefly Airlines, SATA International, Hawaiian Airlines, Delta Air Lines, Allegiant Air, Xtra Airways, JetBlue Airways, Sky West Airlines, US Airways, British Airways, Boutique Air, Contour Airlines, American Airlines, Norwegian Air Shuttle, and Level. If you happen to compare prices from other similar transport companies, TravelCar stands out for giving pocket-friendly parking deals. We are considerate of your tight traveling budget. We aim to make parking affordable and accessible by a majority of the population at Oakland region. Discounts on parking prices are issued to clients who make early bookings. If you are a frequent parker, we have a sweet deal for you. You may lease out your vehicle to be utilized by other travelers. You stand a chance to earn on every mileage covered by your vehicle while in the hands of TravelCar. Please remember that parking is only accessible upon prior booking on our website www.travelcar.com. Whenever you have an inquiry or get stuck during the booking process, please chat with our agents who are online 24/7. You will get all the help possible. However, booking is straightforward. Valet service is a form of parking whereby an attendant from the relevant parking company takes over the parking from you to a designated parking slot. Valet parking is highly advisable for clients who have zero time to scout for a parking space. It is also great in adding class to your trip and give you that special treatment feeling. Valet parking services at TravelCar are accessible 24 hours a day, on every day of the week. Our valet team can handle any type and model of vehicles coming into our parking lots. You are guaranteed the security of your car and a quick turn around time whenever you need it back. Valet parking prices are affordable so you can book the service before your arrival at Oakland International Airport. Enjoy incredible customer support from our courteous and friendly customer service team. They are ever ready to aid you in making your parking reservations. Access our customer support channels 24/7 to ask questions pertaining our pocket-friendly parking deals. 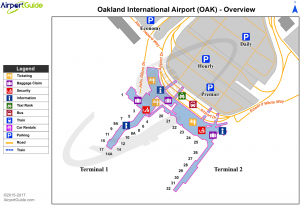 Make prior parking arrangements at the Oakland International Airport. Rail Amtrak Capitol Corridor The main stop is at BART Coliseum Station The train runs daily. Bus AC Transit Route 21 bus avails transport service between the airport and Fruitvale, Dimond District, Bay Farm Island and Alameda. Early in the evening and during the day from 6:00 am to 9:00 pm. Bus AC Transit Route 805 bus links OAK to 12th Street Oakland City Center BART Station in Oakland Downtown. It also reaches Oakland Coliseum Station, Eastmont Transit Center, and 19th Street Oakland Station The bus operates throughout the night. Bus AC Transit Route 73 bus connects Oakland International Airport with Eastmont Transit Center. It makes stops at Oakland Coliseum Station. The bus operates daily. Access other services and amenities inclusive of restaurants, Wi-Fi, bars, gift shops, shoe-shine services. To avoid missing your flight, leave for the airport in good time, preferably two hours or more, before your flight. This time allowance will cover for time spent on traffic and security check at the airport. Since you may have minimal control over public transport facilities, you may consider getting a car rental from TravelCar in any city around Oakland International Airport. Make your bookings now on www.travelcar.com and plan your parking arrangements, valet service and car rental as needed.